Being an avid nature watcher, one never spares a chance to be amidst it. Besides regularly watching the National Geographic, Animal Planet and the History channels on the Television, photography has been the only other hobby than reading. Used to possess a Nikon FT-2 long time ago to be followed with a N6666. Then a Sony and now a D5500 and a D750. My younger child has taken up this hobby to a little more professional level with his own Canon and Nikon cameras. Was a prize winning amateur in my University days and have taken pictures in almost all the terrains that India has on offer. But, within myself. 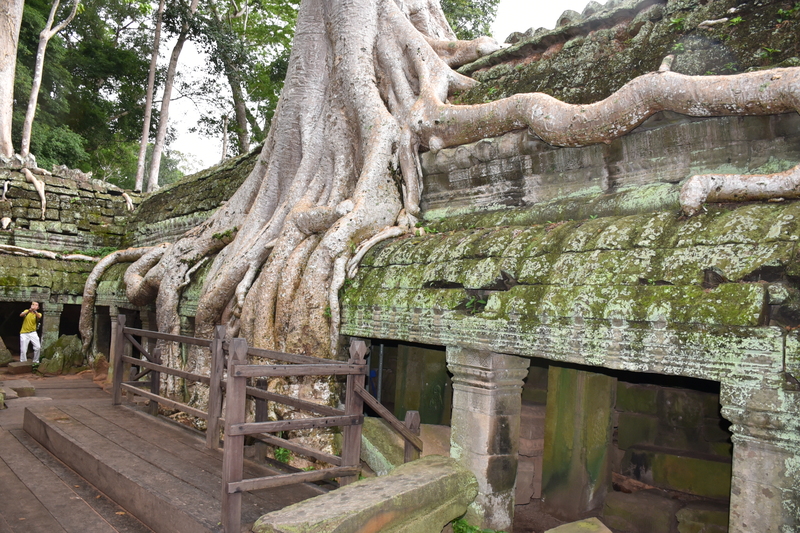 Angkor was always on mind which got unraveled now. Or shall I say is getting into my bone marrow, now. And my regular visits there to capture as many moods of the Lord and His environment as might become feasible. Every time a painter creates a new painting, it cannot be similar to his earlier creations. Every time it has to be a new creation. Every time the Mother Nature brings out a new trick from her bagful of mesmerizing treasure chest, it will always be fresh; every time different. Similarly, every morning is different as is every setting sun; in its palette of colours, its brilliance its soul drenching freshness. 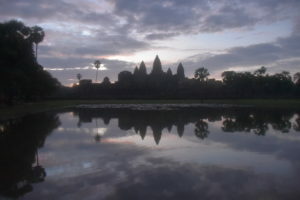 Similarly, every morning every evening at Angkor is entirely different from the one earlier – ever. 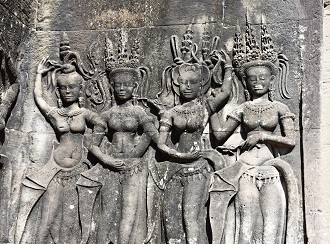 On my first visit I had noticed painters creating very vibrant, very indulgent and very lively paintings of early morning and evening pictures of An gkor Wat. The colours of bright red, burning orange, deep purple, deep seas blue and countless other hues appeared almost surreal; after all these disciples of the likes of none other than Salvador Dali or a Michael Angelo, have perfected the art to the levels of virtuosity, these young boys. My Guide told me that there are Masters in Siem Reap under whose tutelage these young Khmer boys are trained before they take it up as a full time profession. But what they create is absolutely masterclass. And each has a different style of painting. The manner of each stroking their paint brushes as distinct as strips of a Tiger. As distinct as chalk and cheese. All this notwithstanding, the fact of the matter was even more surprising. Not aware what She had in store for me. Didn’t just know. After all the Mother is so unique. Most unique. 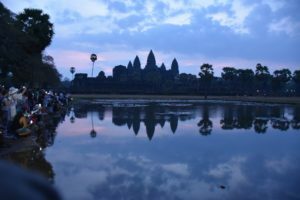 During my first visit, I could not get to see either the evening sun setting over these magnificent Temples or early morning Sun God climbing the Temple Finials from behind the thick forest there. I had cheated myself a little; I thought later. Next time I got up early and my Tuk Tuk Driver Phiya was even more disciplined that imagined. Since it was February, it was nice and early. 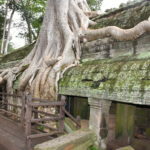 We were at the doorstep of Angkor Wat by five AM. And it was absolute dark. A light wave of chill in that crisp early morning. 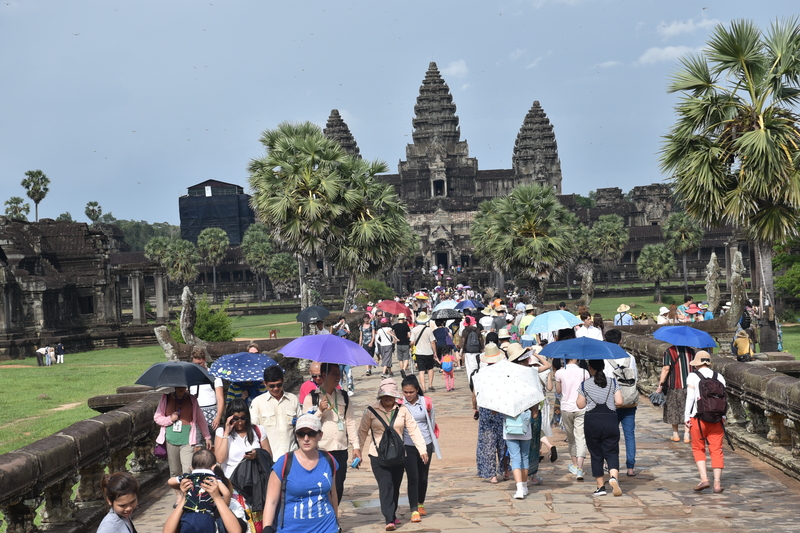 As I was walking towards the Main Gopura onwards towards the Lily Pond from where the fringes of which most early morning photography is done, I could, against the slight ambient light, see faint outlines of the Gopura and the palm trees and my fellow humans walking. And just then I visualized how those dexterous photographers show prides of lions in the night light on a buffalo hunt. It was an exactly same setting, I deemed. Upon reaching and to my surprise I found it was a congregation of at least five thousand enthusiasts like me well before I could muster to arrive there around the Lily Pond. All the right spots fully booked. Cameras on tripods firmly in place. Some young girls went even further, occupying tiny boulders jutting out of the fringes of the pool of water in front. And not to forget thousands of fireflies – the cellphones flickering. People from all races & nationalities still seem to respect elderly people. Though I had arrived after all of them, they still gave me way to the frontline as my Guide ushered me to the best spot so that I am able to make the best of my effort. Armed with my brand new Nikon D750 in my hands, I was all set. After all, expectation of witnessing vibrancy of morning sun colours was shifting gears within my mind. The air around was filled with shatter of a few thousand human congregation. All awaiting arrival of the morning sun with bated breath. I was not aware of what was in store for me. As the first ray of hope along with calming down of whispers broke on the horizon, the photographer in every heart sprang into action. I took the first picture of the First ray of Hope in my life, anywhere. Quickly, drawing out my cellphone, this priceless moment was captured with a view to dispatch it to friends & relatives back home a little later. Cameras began clicking and people bending over veritable backwards to ge t their own prized shot. As the Sun kept rising, I kept taking pictures every almost minute. 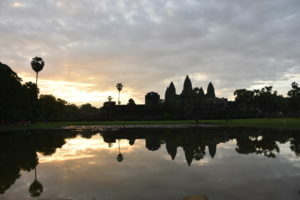 But to my surprise the horizon never came to the vibrancy as seen in those pictures by the Khmer painters. At one point, as I have mentioned in a separate passage, it became charming Blue, the entire Horizon. Defying the VIBGYOR logic, she was, I muttered. All in all the hues I captured till the Sun rose above the Meru Finial that day, were worth; each one of them. No moment lost, perhaps. Some other time for those vibrancies of the Mother, I convinced myself. 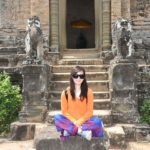 Got back to the Hotel for breakfast and a little rest before moving onto the other Temples. I had to cover a lot. That was February this year; my second visit. Dissatisfaction is not an ailment of human psyche. It is the true motivation as told by Ken Wilbur is his Book No boundary. I again booked myself for end of July 2017, much against caner advice of the Wikipedia that this part of the season may not be very good to visit there. I was on my part keeping a close watch on the weather Gods and its predictions. 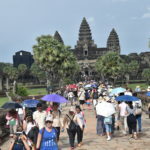 Having arrived at Siem Reap, I found it was nice and fine, the weather. 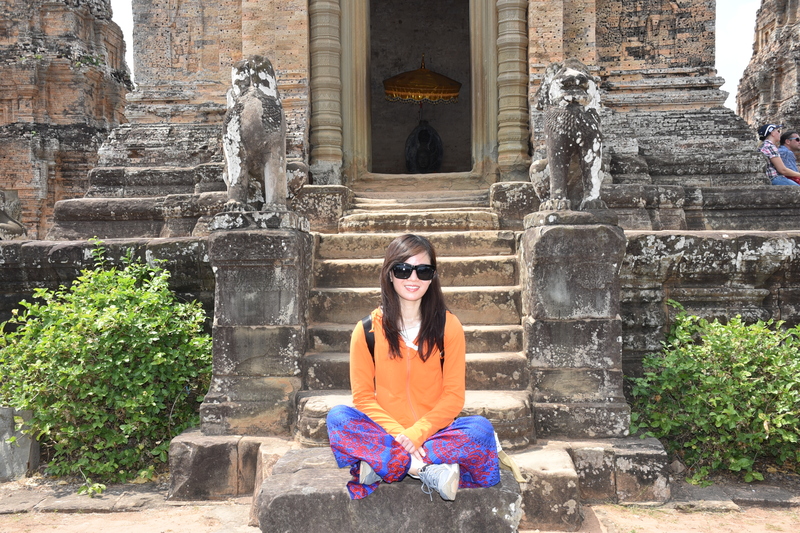 Next day, I was again off to Angkor Wat a little before five AM. It was July end and the sun rises earlier than in the month of February, lest I get delayed in getting my share of vibrant pictures. All this and many more tussles going on within my mind. I had even more significant task on my agenda for that day. 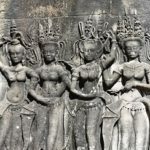 I had to travel to Kulen, something even more enchanting, I was overcome with the thoughts of a witnessing a thousand Lord Shiva Lingas within my mind. The scene was the same again. Lots of people and I quietly slithered into the same spot as a few months prior. Same first ray of hope breaking upon the horizon. Again many cellphones flickering. Again rounds of selfies. Again many pictures by pseudo photographers and those the serious ones. Everyone trying to soak-in as much as was feasible under those circumstances. Again none of the vibrancy of furnace red and oranges and purples. In fact it was totally an unrecognized array of colours of ash and beige. I somehow was reminded of the dying ambers amidst the ash colours of burnt wooden logs at the famous Borodino Panorama by the celebrated Russian painter Franz Roubaud depicting the famous battle between the Russian and the French armies. Similar setting, looking into far off landscape with the colours changing with each level, each distance. Here too, similar setting into the distance with the colours changing every minute. The reflection in the Pool, no less magnetic. People around it, no less enthusiastic. It was to be my moment of being with the Mother. I felt I was alone even in that large crowd; all by myself. Transported into a world away from this world. My world, where no one and nothing else mattered. Having become a little more accustomed to Her chan ging mood, I was fully satisfied with this fresh set of my pictures. Convinced that I take whatever She offers, with grace and as her priceless Gift of love. I did. She is so unique every time. Every time so different. Planning to go back in November/December. Again. I have a promise to keep with myself. I must get that Bright Red & that burning Orange; at least once. I MUST.